As I travel and speak at various venues on social media applications and mobile devices I always open up with a question to the audience. Typically the audience is of the type that uses Electronically Stored Information (ESI) to help solve a crime, litigate a case or remedy a corporation “situation”. I first start out by asking the audience if they utilize the data from social media during ESI discovery. As the hands rise I see the same percentage of 20% holds true across the board no matter the venue. So let us look at the percentage of those using social media evidence in ESI collections to the percentage of actual users of social media on their mobile devices. I will look at statistics to come up with a conclusion stemming from a personal two prong question to the audience of “Do you own mobile device and if so do you use any type of social media?” I will put the polling numbers from my typical talk against those found globally in several categories to test my theory and hopefully gain a better picture of our current dilemma. In 2013 Nielson conducted research on the mobile consumer showing that 61%users own a smartphone and 27% of the world own at least two mobile devices. Furthermore there are an estimated 6.8 billion mobile subscriptions worldwide estimatesThe International Telecommunication Union (February 2013). That equates to 96% of the world population. 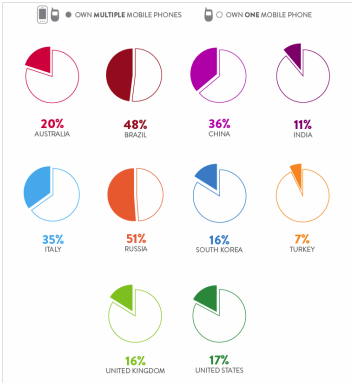 Globally as indicated in both the Nielson 2013 report and marketingcharts.com over 55% of social networking consumption occurs on a mobile device. 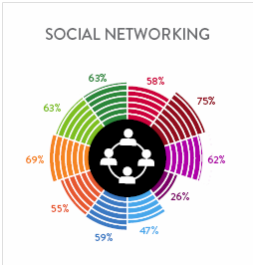 Percentage average for social networking globally is 67.5% as mentioned in the marketingcharts.com article. Today, more than 95% of all information is electronic and further research indicates that almost all cases today will involve some sort or electronic evidence. What is extremely interesting as noted by x1discovery.com in an October 4, 2013 blog is that the pace of cases involving social media has so rapidly accelerated it has been very difficult to keep up. They identified 88 cases in just September 2013 where social media was key to the case and were published on Westlaw. …only one percent of total cases result in published opinions…one can safely assume there were tens of thousands of more legal matters involving social media. Further examination of the cases listed from 2010 and 2011 only two percent mention a mobile device and social media. 320 published cases so far for the first half of 2012 and only one percent mention mobile devices and social media. This is quite staggering and disappointing considering the numbers outlined below. Looking at the numbers we see that my polling numbers are very consistent with numbers gathered by marketing agencies. 98% of my attendees have a mobile device while 96% of people in the world have a mobile device. 70% of my attendees use social media on their mobile devices as compared to the 67.5%globally. 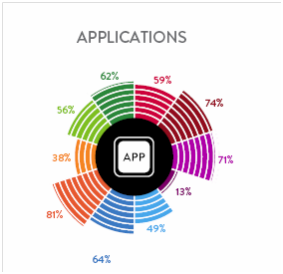 Whilst 95% of all ESI is electronic and 55% of the social media consumption occurs on a mobile device one would say this evidence is widely utilized. This is definitely not the case when looking at the mere 2% of published cases and a 20% usage by my attendees using mobile device social media evidence. I always follow up asking the attendees why there is such a low number of examiners, corporations, service providers and legal teams utilizing data from a mobile device. The differences in answers are quite enlightening which typically center on awareness. Some of the examples and my opinions are listed next. This is very common, but honestly Facebook data (or any data) on a mobile device is much different than on Facebook’s server or living on the custodian’s PC. Local images, cache and deleted posts along with associated applications are a few differences. Complexity, software, knowledge are but a few that can be lumped into logistics. There are very competent service providers that can help train, conduct collections and evidence analysis as well as testify to the procedures that need to be followed in a court of law. Those conducting any type of investigations from legal and corporate review, HR, criminal and civil cases must understand information contained on a mobile device is much more relevant and often critical to the painted picture, especially when it comes to social media. This information can be obtained quickly and efficiently from these mobile devices, extracting critical data and analyzing the information to be used immediately or stored for retention. AccessData’s Mobile Phone Examiner Plus is one such tool. The only question you need to ask yourself when determining if social media from a mobile device is critical to your case.